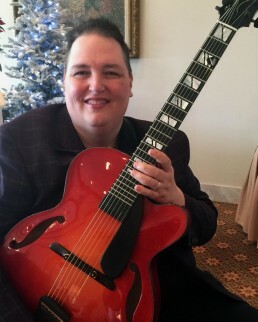 Acclaimed seven-string jazz guitarist Ted Ludwig (b. 1974, New Orleans, LA) has been a part of the jazz scene in New Orleans since 1997. Throughout that time period, he has performed for numerous club performances, festivals, and recordings. He has released 4 albums as a leader and many more as a versatile sideman and co leader. Ted earned his Bachelor and Masters Degrees from the University of New Orleans Jazz Studies Program, under the direction of the legendary pianist Ellis Marsalis Jr. He received an ASCAP award, the Louis Armstrong award, and the Overture to the Cultural Season award for his outstanding musicianship and creativity. Inspired by the recordings of Joe Pass, Pat Martino, and Wes Montgomery, Ludwig soon became one of the most sought after guitarists in the New Orleans jazz scene, working professionally as a soloist, and accompanist. In 2005, in the wake of Hurricane Katrina, Ludwig created his own eclectic Jazz Trio gaining instant accolades from critics and musicians alike for his astonishing virtuosity and prolific originality. ​Since 2007, Ted has maintained a fruitful association with the Infrared Record Label. He has recorded, produced, and released four albums as a leader and has continuously performed on many other recordings as a co-leader and sideman. In 2016, Ludwig had the great opportunity to perform with orchestra an original Jazz Guitar Concerto entitled “Katrina”. The piece was composed by D.J. Sparr and commissioned by The Arkansas Symphony Orchestra. Ted received rave reviews for his performances of the concerto. Joe Vick is a Little Rock native and has spent most of his career teaching and performing jazz & classical music throughout Arkansas. He received a Bachelor’s Degree in Music Education from the University of Arkansas at Little Rock and a Masters Degree in Performance from Memphis State University. He was a member of the Arkansas Symphony Orchestra for 39 years and continues to manage and perform with the orchestra’s biggest band. He is a former member of the Memphis Symphony Orchestra and has performed with many orchestras and chamber groups throughout the state. As a jazz musician, he has performed with numerous notable musicians with international recognition. The list includes Mose Allison, Randy Brecker, Marc Elf, Herb Ellis, Eddie Harris, Barney Kessell, James Williams, Bob Dorough, Jon Hendricks, and Ernie Watts, to name a few. 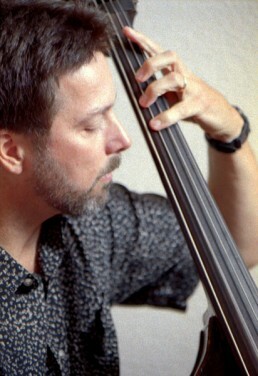 He was the house bassist for the Monday Night Jazz series sponsored by the Arkansas Jazz Heritage Foundation at The Afterthought in Little Rock from 1994-2011 and was inducted into the organization’s Jazz Hall of Fame in 2014. He is currently the bassist with the Ted Ludwig Trio and is the house bassist for Infrared Studios and Emmanuel Baptist Church. He taught string orchestra classes for Pulaski County Special School District for 31 years and continues to teach as an adjunct professor at the University of Arkansas at Little Rock and Arkansas Tech University. Brian was born in Maine. He was lucky enough to have a father that loved Music, especially Jazz. At 14 Brian had his first gig. Over his teen years he was exposed to a number of truly great players and performed with many of them. The list includes, Louis Armstrong, Howard McGhee, Charlie Mariano, Benny Golson and many others. Over his career, he has played with a wide variety of musicians. Lightnin’ Hopkins in the 1970’s as a duo. At the same time, he was involved with a fusion band that was an opening act for Weather Report and Ramsey Lewis. He moved to Arkansas in 1983. He has performed with local and touring musicians for concerts and musical theater. He recently performed with Herbie Hancock. 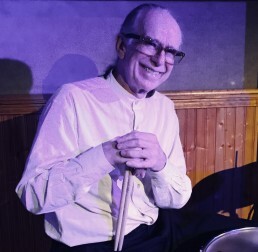 He has been part of the Ted Ludwig Trio since 2005.